A bunch of us met up a rode the Wethersfield Park last night. It was in the low 70's and sunny...ideal riding weather! Steve Morse was going off boosting over the roll-in hip and bombing mach speed lines/gaps in and out of the bowl. 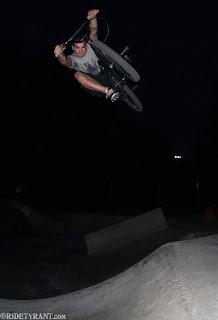 I don't think I've ever seen a rider session the bowl so heavy in all my years riding Wethersfield. Blachura was out rocking his new Sinister frame and Bern helmet, gotta love sponsors! Arnwine was trying a big whip to flat over a plastic jersey barrier. I don't think Bry landed a clean one, but he was really damn close and I'm sure he'll get it next time. Either way, it was burly! The session ended with some pissed off father showing up to the park and getting in a kids face who mouthed off to his son. Word to the wise...all the young kids talks sh!t at the park...including your 12 year old son! Everybody just needs to keep their mouths shut and ride their boards/bikes and have fun. This grown man was really about to fight a 15 year old kid...so lame! That's the kinda BS that is going to get the park shut down! After Wethersfield, Arnwine, Steve, and I rode a little street in Middletown. Typical Spear Park session...ledges, manuals, and crack heads cheering us on. Priceless! Fall is almost here and the daylight is disappearing fast, get out and ride!! !